Passion Creates Strength. Strength is Beauty. Strive to Thrive. I have always been one to have a plan. I love structure, routine and knowing what is coming. When I am caught off guard or things change suddenly, I often have to take a few minutes to compose myself and allow my brain to re-shuffle, problem solve and get back to feeling in control. Well, as I am sure we all know, that isn't really how life works. Despite my long term goal setting and major life planning, not everything goes according to plan. From a very young age I knew how my life would play out. Graduate high school, go to college and meet my future husband, start my career, get married and have babies. Nothing made me happier than the good old playground song of, "First comes love, then comes marriage, then comes Em with the baby carriage". Yes. That is exactly how my life would go, I just knew it. Despite people telling me I may need to let go of my life-line as I got older, my response was always met with a scowl and a confused, "Why should I?" As I progressed through life, everything was working according to my plan. It was like all the energy I had been brewing my whole life had been received by the Universe and was coming back to me full force. I was a lovely "good witch" stirring my life cauldron and seeing as my future spell played out just as I had anticipated. I went to college at 17 and met the man of my dreams at 18. I worked hard in school (while doing my fair share of socializing) and finished a semester early allowing me to start knocking out some graduate work. 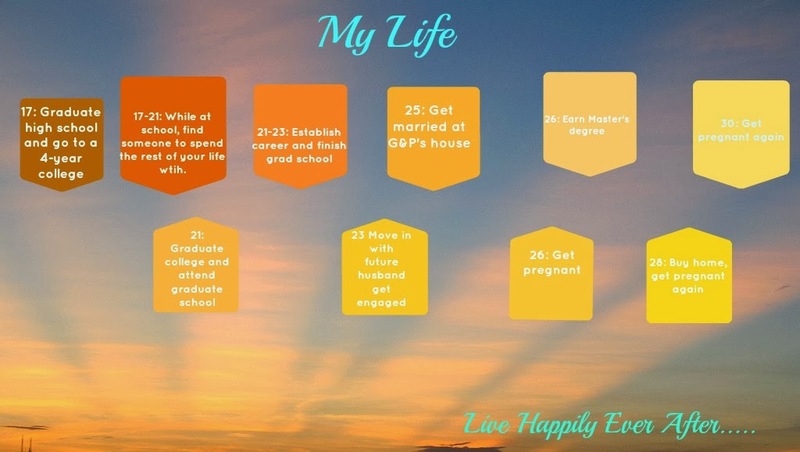 Upon graduation at 21, I was already enrolled in a graduate program and moving home to get started. My boyfriend was also moving home to get his career started as a fire fighter. Within a year he was on his own and after he had settled he asked me to join him. I moved away from my friends and family to show my commitment to him and had my dream diamond on my finger just six months later (start tapping your fingers together, in almost an evil way)...it was all going according to my master plan. We were married 18 months later and the wedding exceeded everything I had dreamed of as a little girl. Soon we were professionals, saving money and ready to start a family...a year after we were married of course. We had our big "discussion" over chips and salsa one night and decided it was time to go for it. We had been married for nearly a year and were ready to start popping out babies. I wanted 5, my TH wanted 2, so "we" agreed on 4...or as my TH said, "Let's get through one at a time". We tried...and tried....and tried...but nothing. A year passed, we went to the doctor and the tests started. Something definitely wasn't right, but we weren't sure what. So the tests continued...and continued...and continued...still no babies, still no answers. What the HECK was this massive wrench being thrown in my life plans?! Didn't the world know I had a schedule here?!!!!!!!!!!! I was completely distraught, I didn't know why this was happening to us, why was my plan suddenly being so torn apart, I had come so far! Then those wise words started to resonate in my head, "You need to let go of these plans", "Just enjoy life as it comes, don't always be thinking ahead", "Be careful, sometimes things don't always work out as planned". Wow, that cauldron of mine, suddenly wasn't looking the right color. This was life. It isn't always how you plan it, it isn't always how you want it, but you have to find the good in what you have. I had an AMAZING husband. We were lucky enough to have access to great doctors and insurance to cover the many tests needed. We had wonderful careers, a beautiful home, great friends, a loving and supportive family and most of all we were healthy and very in love. We could conquer anything and I knew we would. I never turned away from a challenge and I wasn't about to start now. I did what I do best, made a plan. While learning to let go of life-lines was a very hard process for me, it was one that needed to be done. I was able to step back and appreciate each day for all that I had and find good in each moment. I never stopped looking in that crystal ball I had in my mind and each night when I fell asleep I saw my TH and I with a house full of children, I knew it would all work out....as it always does. Do you have a life-line? Has yours gone to plan or gone awry? We THRIVE on comments, so please share your thoughts with us! Copyright © 2015 Free Blogger Templates | Distributed By Gooyaabi Templates. All rights reserved.